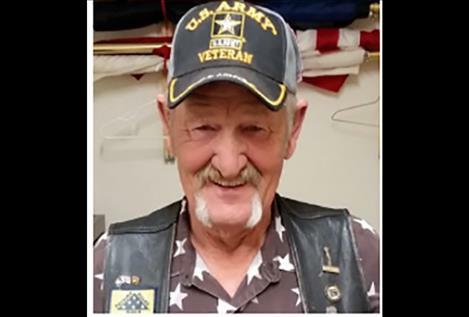 When asked how he came to join the Army, Slim says, “The judge sent me.” In December of 1962 he was caught with “adult beverages,” but he was not an adult. 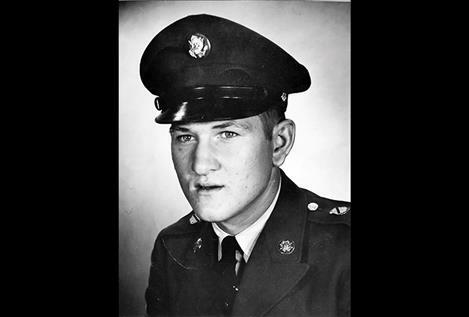 In January 1963, he had a choice to make, and joining the Army seemed to be the best of the choices the judge gave him. Slim remembers going by bus to Butte, Montana on Jan. 20, and in honor of the occasion, the temperature was -39. He was formally “in” on his 17th birthday. For eight weeks, Slim took basic training at Fort Ord, California. He says he was just a kid, and it was all right. Farm kids were used to stuff like they had in Basic. He continued at Fort Ord for the next eight weeks at AIT (Advanced Individual Training) for truck driving school. He enjoyed learning to drive military trucks and jeeps. He was issued a military driver’s license that was good up to 60 days after discharge, and Slim took advantage of that. After AIT, Slim had two possible assignments: being an MP (military police) in Alaska or a truck driver in Germany. The Army decided he should go to Germany and he soon found himself on a transport ship, the USS Patch. As a “landlubber,” Slim liked being on the ship. He was not seasick at all – not much bothers Slim. The ship docked at Bremerhaven on the North Sea coast of Germany. From there he went by train to Manheim, which was the center of operations. The part of the post they lived in had been a German horse cavalry in WWI. As a truck driver, Slim logged over 100,000 miles, and there was not an Army post or Air Force base in Germany that he didn’t get to. With a top security clearance, he hauled everything from nuclear weapons to payroll. In 1963, President Kennedy was shot and Slim spent the next six weeks “locked and loaded” on the Czech border (Czechoslovakia). There was a fence then a minefield and then another fence. There were ten times as many East Germans and Russians as U.S. troops, and they were right there, ready to walk over us like salt if we hadn’t been prepared. Slim’s unit was ordered to go to Viet Nam in 1964 and they packed everything up, but then, they were ordered to “stand down.” They were never told why orders were changed. Slim went back to work, but then, again, in the first part of 1965, there were orders to pack up for Viet Nam. The U.S. presence in Viet Nam was mostly advisory at that time and the Army needed truck drivers there for hauling stuff. Once again, the orders were canceled and the trucks unloaded. Slim remembers that on May Day no one could leave the post because it was a big day for celebrating old communism stuff and there was no need to stir up trouble. Slim remembers one bad incident. The number one rule when driving the German autobahn is “Don’t stop.” One night there was a German truck stopped right on the highway and Slim plowed into him. “Thank God for tough Army trucks,” he said. Slim chased the driver around the truck with a tire iron and said it was a good thing he didn’t catch him. He still has nightmares about the wreck. One week after the 1964 winter Olympics held in Innsbruck, Austria, Slim and four other guys on leave rented a car and went to Innsbruck. He remembers Austria as a beautiful country. It was his only leave, so when he was discharged, he got paid about $300 for accrued time. That was a lot of money in those days. In November, Slim met and married a German gal and moved off post to her place downtown. One and a half months later, he would be shipped back to the United States. There was a lot of paperwork involved to allow his wife to join him because her father had been an SS Colonel, a higher up in charge of all Nazi food distribution. After a time, Slim and his father-in-law became friends. The couple was married for 43 years. As part of “Operation Santa Claus,” Slim was supposed to get an early release before Christmas in 1965. The ship hit a big storm and for five days the ship was up and down, sometimes with all three propellers out of the water, and then, it would dive back into the waves. When the ship started going up and down and sideways, that’s when guys got sick. Again, Slim wasn’t bothered. Then, old WWII mines started popping up in the English Channel, so the route home was changed to a north route. On Christmas day, the ship was still bobbing up and down in the ocean off Newfoundland. The ship finally docked at Fort Dix, New Jersey, where Slim was discharged. Somebody had stolen his low quarters (shoes) so he was discharged wearing the black cowboy boots that were with his civilian clothes. A guy from Absarokee, Montana, who had gone over to Germany on the same ship as Slim was also on the same ship coming back. The guy had bought a Volkswagen in Germany, brought it back to the states and was driving home, so Slim rode with him. They spent a night in a motel in Dodge City, Kansas, where Slim accidentally left his dress uniform on the back of the door. By the time he realized it, it was too late to go back. Fifty years later, the guy had moved to Salt Lake City, Utah, and while unpacking some stuff, ran across a dress uniform. It had Spec 4 on it and that wasn’t his rank. After checking the pockets, he found Slim’s phone number, which had not changed, and gave him a call. Did the uniform still fit? “Ha, ha!” Slim continued to stop by and see the guy whenever he went through Salt Lake. Slim thinks the draft should be reinstated because young people today need to learn more discipline and respect. He would include women, and if they have guts enough to join the service, they should have guts enough for combat. Slim served successfully in military service for three years, which was not bad for a kid who was “recruited” by a judge. Thank you for your service, Slim.